Hello and welcome to Day 3 of previews of The Greeting Farm June release! 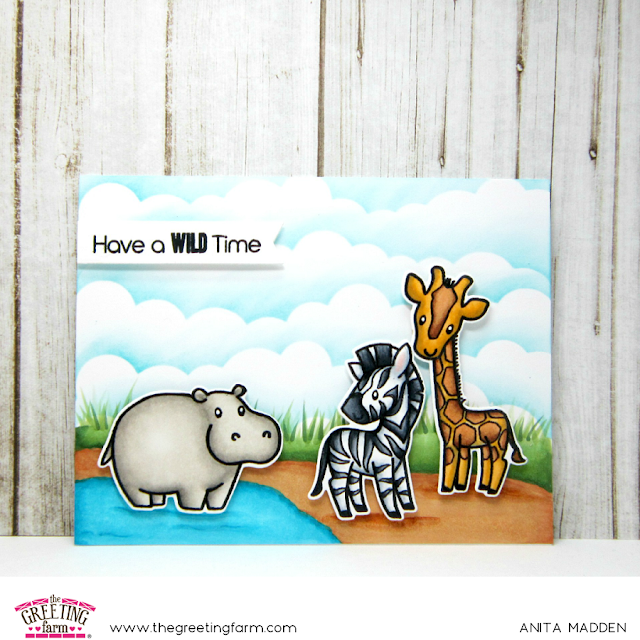 Today I'm sharing the new Wild Time stamp set! This is another fabulous set that you're going to want to add to your TGF collection! There are lots of safari animals and fun sentiments. I colored everything with copics and then diecut them using the coordinating dies. I created a background on my card using copics for the pond, dirt, and grassy areas. I used a stencil and distress inks to create the cloudy sky. I adhered all the animals with foam tape to give my card some dimension. I hope you stop back tomorrow for our last day of previews. Be sure to stop by The Greeting Farm Blog to see what the rest of the amazing team made with this adorable set! Great card, I love how you did the clouds.